Web developers, rejoice. On Monday, Panic announced that, come Thursday, it will unleash Coda 2 for Mac and Diet Coda for iPad. 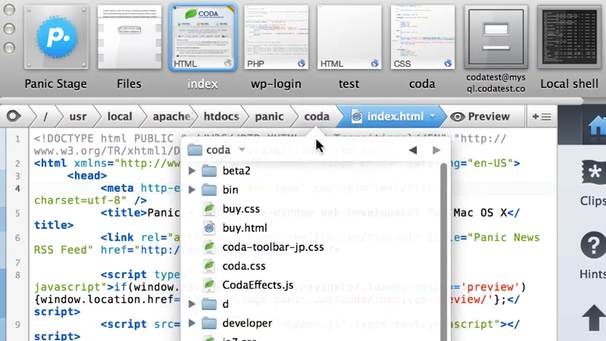 Coda is Panic’s wide-ranging Web development editor. The original version offered a tabbed interface that let you write and edit HTML and other code, create and modify CSS, do command-line work, generate live previews, look up code references, and transfer files back and forth via SFTP, FTP, or WebDAV—all within a single app. But the original version of Coda ( ) dates back to 2007, and was missing a few key features even then; it’s grown only longer in the tooth during the half-decade of Web technology advancements since. Coda 2 adds in those missing features Coda-dependent developers have clamored for over the past five years—along with a variety of features we hadn’t been smart enough to ask for yet. Top amongst the hallmark additions is code-folding, for collapsing snippets of code that take up precious screen real estate but don’t require frequent review. The other big feature finally arriving in Coda is support for autocompletion of custom variable and function names; Coda already offered that functionally for pre-defined function names, but now learns your codebase’s custom controls as well. While the original Coda prided itself on offering all the core functionality Web developers needed in a single window, it lacked support for a key feature common to many in the Web field: MySQL databases. Coda 2 adds an integrated MySQL editor for visually modifying tables and running manual queries against them. With Coda 2's active path bar, you can quickly navigate to other files and folders on the server. Also new in Coda 2 is an active path bar that lets you quickly navigate to other files on your Web server. You can click and hold on portions of the file path in a given document’s header to open it as a menu, listing the other files and folders available there. One other clever feature in Coda 2 is the ability to send live previews of the code you’re working on to your iPad—powered by the other new app Coda announced Monday: Diet Coda. The app includes options for editing code, working on the command line (as is offered in Panic’s standalone iOS app Prompt), and visually modifying files on the server. Coda 2 will cost $49 during its first 24 hours of availability. After that first day, the price will jump to $75, which Panic describes as “upgrade pricing for everyone.” At some as-yet-undetermined point after that, Panic says, the price will go up to the $99 price point that the original Coda used. Customers who bought Coda April 10, 2012 are entitled to a free Coda 2 license—unless they bought from the Mac App Store, which offers Panic no means to extend that offer. Diet Coda will start at $9.99 for its first 24 hours of availability; after that, its price will jump to $19.99.